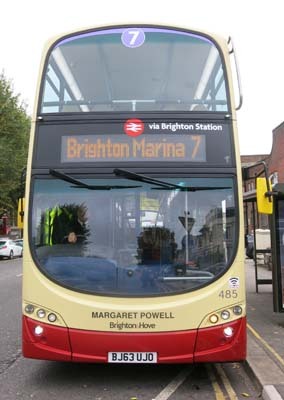 Connections with Brighton and Hove : A delightful and natural character, Margaret Powell achieved fame late in life when she found she had a natural talent as a raconteur and writer. Born in 1907, she was the eldest daughter in a family of seven and she had to look after some of her siblings. Her parents could not afford to keep her at school to achieve her wish of being a teacher, so she had to go into domestic service. She did this for ten years before marrying a milkman called Albert. They had three sons. When they had grown up, she brushed up her education and went to night school to take O and A levels. 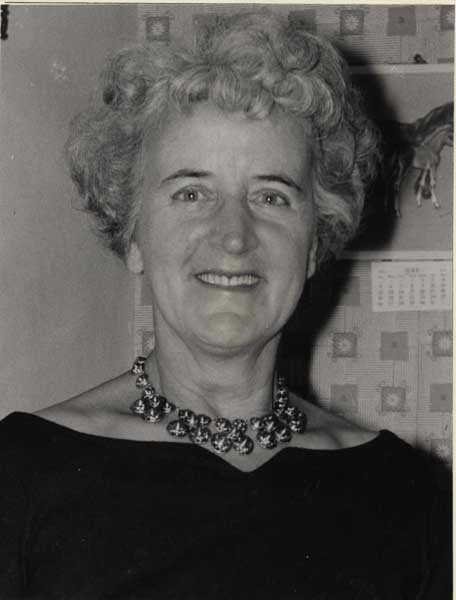 She was discovered in 1966 when the BBC took her from her evening class group to talk about her life in service. A publisher who was listening was impressed and asked if she wanted to write a book. The result was the best seller Below Stairs and she wrote 17 other books in similar vein, showing a sharp eye for detail and comedy. Her infectious laugh became well known on radio and TV and she delighted in her celebrity. 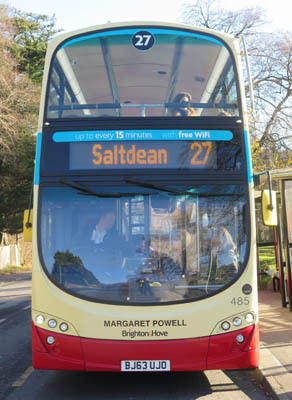 Margaret Powell fought breast cancer for many years while going through the agony of watching her eldest son, David, die from a brain tumour. She died in 1984. 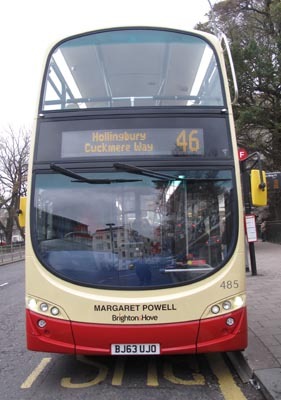 She had lived in a house in Old Shoreham Road, Hove, where a blue plaque has been erected in her memory. 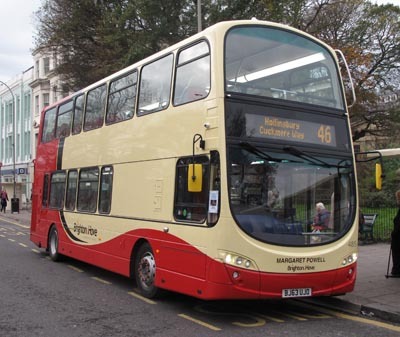 485 Volvo Gemini - carried name since delivery in November 2013. 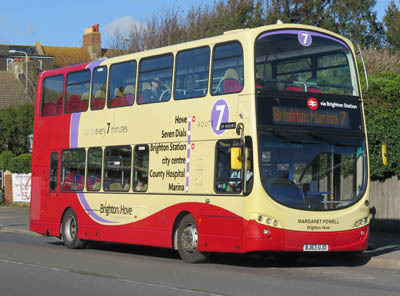 (Previously on bus 837) Route 7 branding added October 2015. 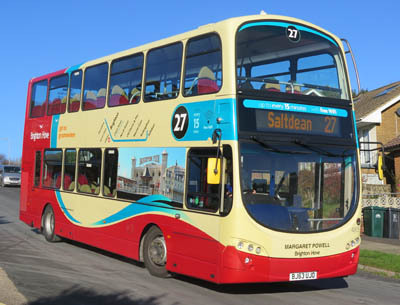 Route 7 branding changed to Route 27 November 2017. 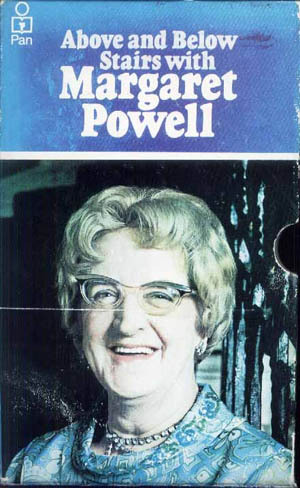 Photograph of Margaret Powell reproduced with the kind permission of the Royal Pavilion, Libraries and Museums (Brighton and Hove).